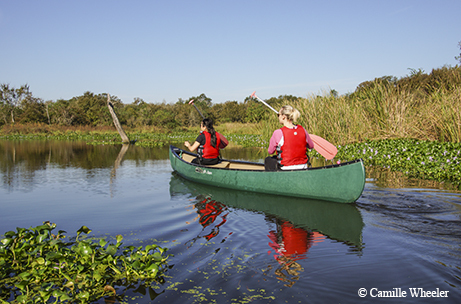 Find the middle of nowhere in the middle of everywhere on an urban paddling trail. In the fall of 2016, I launched my urban Texas Paddling Trails investigation. As a beginning paddler, I kayaked and canoed 20-plus miles of river, lake, creek and bayou trails in Fort Worth, Grand Prairie, Houston, San Antonio and Pasadena, near NASA’s Johnson Space Center. Throughout my metropolitan exploration of the Texas Parks and Wildlife Department’s Texas Paddling Trails program, I never left the concrete jungle. Now in its 20th year, the program counts 72 officially designated public inland and coastal trails in rural and urban settings, with its most recent addition in February — the Mission Reach on a restored section of the San Antonio River near downtown San Antonio. I paddled alone (always a bad idea) and with groups on guided tours. I made boat delivery and shuttle bus arrangements. I tried out equipment, renting or reserving four types of kayaks and one canoe. I always donned a life jacket, but sometimes neglected to wear a hat or sunscreen. I rarely drank enough water. I got stuck in shallow-water gravel, scraped my boat on rocks, muscled across a cove in moderate wind conditions, paddled around piles of post-flood woody debris, bumped into other people’s kayaks on group tours and banged my vessel’s nose into shorelines. Repeatedly. I coordinated all trip arrangements by first visiting the Texas Paddling Trails website, which offers a comprehensive array of safety and planning information. My goal, as originally discussed with TPWD nature tourism manager Shelly Plante, was to show Texans the urban paddling opportunities available to them in the hearts of big cities, near picturesque skylines and in outlying metropolitan areas. As Plante notes, outdoor recreation conversations often focus on rural Texas, where people are more likely to have ready access to waterways, be familiar with access sites and own their own kayaks or canoes. Outings typically involve urbanites exploring rural areas, but not vice versa, says Plante, who helps process paddling trail applications, works with community partners and coordinates launch events for newly designated paddling trails. “It’s trying to get urbanites to realize what’s in their own backyard,” she says. It’s a matter of encouraging novice paddlers like me to build their comfort levels close to home. New paddlers (perhaps intimidated by the logistics of some rural paddling trails) can practice on shorter urban loop trails where they will remain in cellphone range, are closer to assistance if needed and won’t require shuttle delivery to a separate take-out point. Once paddlers gain experience, and start purchasing their own equipment, they’ll have the resources to start exploring more trails. “You have to start where beginners are to get to those next levels,” Plante says. “You can’t say, ‘Here are these amazing experiences for a 25-mile paddle’ and expect them to go out and do it — it’s not reasonable." 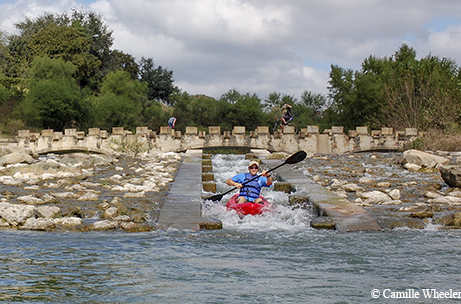 Fort Worth's paddling trail offers a natural escape on the Trinity River. My journey began on the Fort Worth Nature Center and Refuge Paddling Trail, designated in November 2015 as TPWD’s 70th trail. Romanticizing the idea of solitude, of which I found plenty just 10 miles from downtown Fort Worth, I made a rookie mistake: I paddled alone. Plante emphasizes that on-site paddling trail kiosks feature these basic safety rules: Never paddle alone, and always file a float plan — telling someone where you are going and when you expect to return. Smith, a program specialist within TPWD’s Inland Fisheries Division, provides the answer. Smith, a 20-year veteran paddler with TPWD, once made an emergency repair to his leaking kayak after paddling a short distance on the San Marcos River. He started out with a group, but no one noticed that Smith had fallen behind when his cracked kayak started to sink. Smith pulled his kayak to shore and patched it with duct tape carried in his waterproof bag. I was nowhere near that prepared for my Fort Worth paddle. But I did exchange cellphone numbers with Tim Tenery and his wife, Lori-Ann, at their Fort Worth Kayak Rentals business where I signed rental paperwork. Then, I followed Tenery and his assistant Roy Ash to the nature center where they unloaded my kayak from a trailer and helped me plan my estimated four-hour trip. As I pushed off into the West Fork of the Trinity River, I immediately liked the maneuverability of my lightweight Old Town Vapor 10 kayak. And I liked Tenery’s suggested route: Head southeast, toward Greer Island, to explore part of the official TPWD paddling trail. Then turn around to explore the path that local paddlers treasure — a narrow stretch of the Trinity River that cuts through bottomland hardwoods and the eastern edge of the Cross Timbers forest ecosystem. On the official TPWD trail, I paddled into a magical world of wetland marshes separated by long, thin islands. Great egrets, snowy egrets and great blue herons stalked prey, ghostlike, in an aquatic sea of smartweed, bur-reed and water willow. I turned around, keeping my eyes peeled for the Trinity River’s resident alligators. Deep into the river’s narrow stretch, off the official paddling trail, I suddenly spotted a young alligator straddling a log. Shuddering with fear and wonder, I studied the reptile’s webbed toes, bony scales and open, unblinking eyes. The paddling trail in Grand Prairie combines lake paddling with a journey up the winding, shaded waters of a creek. Grand Prairie offers a different kayaking experience on the Joe Pool Lake and Walnut Creek Paddling Trail: a trip across open water into a shaded stream. Inside the Camp Store at Loyd Park, where I’d made a kayak reservation by phone, volunteer Peggy Shea gave me some bad news: Wind speeds were gusting between 11 and 15 mph; anything higher than 10 mph rules out open-water paddling. It was too dangerous to let me cross the lake. OK, I said, disappointed but grateful for Shea’s decision. I wanted to be safe. Then, Shea and another volunteer, Don Ullom, considered my question: What if I only paddled Walnut Creek? They agreed to let me paddle to the creek from the beach of a semi-wind-protected cove. I followed Ullom to the beach where he pushed a fishing-style kayak, an Emotion Stealth Angler, into shallow water. Ullom helped me board, pointed me in the direction of Walnut Creek, and told me to call him when I was ready to return. I paddled into a stout, manageable wind, searching for the buoy marking the Walnut Creek entrance. The creek and the cove, with its graveyard look of bare trees rising above the water’s surface, bore the marks of flooding from 2015. Upon reaching the creek, I suddenly wished I wasn’t paddling alone as I worked my way around floating masses of woody debris. Once tucked inside the creek’s banks, I could hear, and just barely feel, the wind whistling through the trees. Spooked great blue herons flew before me, disappearing from view around the bend. I left Loyd Park feeling a healthy dose of respect for the elements. For the rest of my urban paddling trails investigation, I would stick to this resolution: No more would I paddle alone. 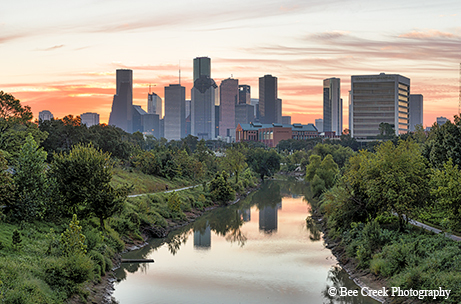 The Buffalo Bayou Paddling Trail takes paddlers through the heart of Houston. One week later, I stood in a downtown Houston parking lot, staring up at the concrete lanes of Interstate 45 almost directly above me. As we boarded a Bayou City Adventures shuttle bus, the other paddlers and I, gathered here on a mid-October Sunday morning, excitedly discussed our trip: a guided kayak tour on a portion of the 26-mile Buffalo Bayou Paddling Trail that cuts a path through Houston’s urban core. Officially designated as a TPWD paddling trail in 2009 — and the first such venue in Houston — the trail features 10 TPWD access points. No one in our 18-member group had paddled any stretch of Buffalo Bayou before. So it was with a special sense of wonder that we set out, following lead guide Nick Ellis single file like baby ducks behind their mother as our tandem Ocean Kayak Zest Two EXP boats snaked around the first bend. We settled into the pace dictated by the narrow, winding bayou as we paddled beneath the Loop 610 bridge and into the River Oaks neighborhood. Its mansions and manicured green lawns stood in stark contrast to upended tree roots, eroding banks and scraps of trash — evidence of recent flood damage. Yet thanks to the conservation efforts of many people and groups, including the Bayou Preservation Association, which works in partnership with other organizations, this historic waterway once used as an urban drainage ditch is on the obvious road to recovery. A great egret stood still as we passed, its white feathers shining bright in the sun. Cicadas sang from the forest-green loblolly pine, sycamore and black willow trees that marked our passage into the heart of the city. Ellis laughed. With Houston’s skyline soon to come into view, we were obviously a long way from the country. As our group returned to the water, we encountered more paddlers. The closer we got to downtown, the busier the bayou became. I felt like a celebrity as pedestrians waved to us from footbridges and hike and bike trails. No, we weren’t in the woods. But we were surrounded by nature, in the middle of nowhere in the middle of everywhere. Matthew Driffill of the San Antonio River Authority blasts down one of the many chutes on the Mission Reach portion of the river. 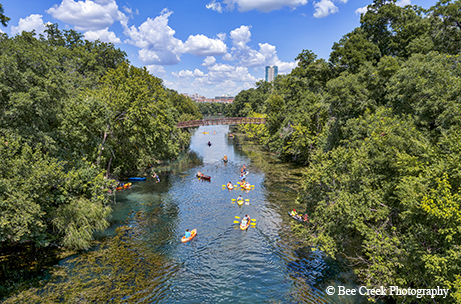 In late October, I paddled San Antonio’s ultra-fun Mission Reach: an 8-mile section of the San Antonio River where a remarkable ecosystem restoration is reconnecting the city to its cultural and historical roots. The Mission Reach became TPWD’s 72nd, and newest, officially designated Texas Paddling Trail in February through a partnership agreement with the San Antonio River Authority. The $271 million Mission Reach ecosystem restoration launched in 2008 has returned the river channel to a more natural state, reversing the damage caused by flood-control measures. In 1954, the U.S. Army Corps of Engineers authorized the San Antonio River for channelization. Floodwaters were successfully diverted away from the city, but the straightening of the river’s natural meandering course crippled the riparian ecosystem, with floodwaters concentrating within the channel itself. Now, as a result of the decade-long revitalization, the river is once again following its age-old natural, meandering course as it flows near the city’s four historic Spanish missions in the San Antonio Missions National Historical Park. The river authority will continue to manage the trail, which has been open to the public since 2013, and plans to incorporate the official TPWD Texas Paddling Trails logo into existing signage. The Mission Reach’s 447 total acres of aquatic and riparian woodland habitat restoration provide natural flood control. The river also features riffles, runs, pools and embayments — all essentials of a diverse river channel. And on a gorgeous late-October afternoon, I experienced the most dynamic component of the Mission Reach: rock and concrete canoe/kayak chutes that — I can say this now — are both fun and functional. I anticipated a relaxing journey with my paddling companions, recreation superintendent Matthew Driffill and community relations coordinator Summer West of the San Antonio River Authority, who booked our shuttle trip with Mission Kayak. But after we launched our kayaks at Roosevelt Park, two miles south of downtown San Antonio, Driffill told me about the Mission Reach’s chutes: manmade slides, of sorts, designed to move paddlers downstream during even the lowest river flows. Doubting my paddling skills, I nervously asked: All right, how do we do this? Driffill smiled and said the chutes do all the work for you. Just point your kayak’s nose right in the middle of them. And with that, he paddled down the first one and disappeared from view. After West went down, it was my turn. Envisioning a steep roller coaster, I feared I would turn over. But my lightweight Perception Tribe 9.5 kayak easily handled the chute’s short, gentle slope. I let out a whoop as the current propelled me downward, and straight into West’s kayak as I lost control at the bottom. I apologized, and West laughed, making me feel better by recounting the time another inexperienced kayaker went down this same chute backward. Several chutes later, as we completed a 5-mile paddle on a partial Mission Reach trip, I realized I had lost count of the chutes and the wildlife we observed: great egrets, snowy egrets, double-crested cormorants, great blue herons, little blue herons, belted kingfishers, a pied-billed grebe, sandpipers, turtles and a diamondback water snake. 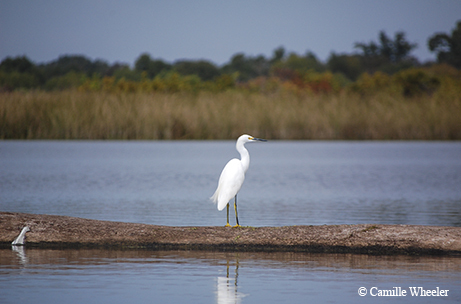 Paddlers on the Armand Bayou Paddling Trail keep an eye out for alligators and the abundant bird life. The final stop on my urban paddling trails tour was the Armand Bayou Paddling Trail in Pasadena, one of the original seven coastal trails designated by TPWD. Located about 20 miles southeast of downtown Houston and near NASA’s Johnson Space Center, the trail is surrounded by urban development competing with riparian coastal flatland forest and tallgrass prairie habitats. But as I discovered during a guided canoe tour in early November, the interior trail itself is as country as it gets. I reserved the tour with the Armand Bayou Nature Center, which provided the canoes and the volunteer guide, Rich Fair, an electrical systems engineer for NASA. I was joined on the tour by married couple Tammy and Syd Sexton of nearby Deer Park and Vicki Nguyen and Haylea Vige, who attend the University of Houston-Clear Lake. Shortly after we put our three canoes in at Bay Area Park, the wildlife action heated up. Knowing that alligators thrive in the bayou — and fully expecting to see one — I jumped every time an alligator gar leapt out of the water. We paddled deeper into the bayou, negotiating hairpin turns. Bird life was abundant, including egrets, cormorants and kingfishers spectacularly dive-bombing the water. Sure enough, several minutes later, Nguyen and Vige both hysterically laughed and screamed as an alligator jumped from a bank into the bayou right beside their boat. I looked just in time to see the gator’s tail end splashing into the water. Well, shoot, I thought as we returned to the bayou’s deeper channel. I’m not going to see a whole alligator today. But then I heard Fair yelling from the back of our canoe. An immense alligator was leisurely swimming 20 yards straight ahead. We paddled faster, trying for a better view, but the beast slid beneath the water. It seemed the perfect ending to my urban paddling trails investigation. Now, of course, I want to buy a kayak. I want to explore as many Texas Paddling Trails as possible. I think it’s safe to say: If I can paddle these trails, anyone can. Loops from 3 miles to 11 miles long near downtown Austin. A 1-mile loop through shady willow thickets, water lilies and open water in an area known for wildlife north of Dallas. A 10-mile trip near downtown with contrasting segments — an altered, channelized river segment in the first half and a tree-lined natural river corridor in the second half. 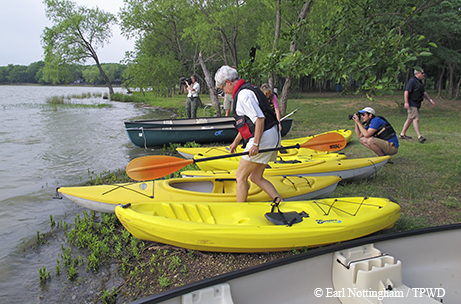 An 11-mile paddle along the shores of a lake in the Dallas-Fort Worth Metroplex. A 2-mile loop on the Bosque River or a 5-mile loop on the Brazos River through the middle of town. A series of routes along the coastal island's western shoreline with fishing and birding opportunities.